Nicolas Almagro is a Spanish professional tennis player, ranked 10 on the ATP World Tour. Nicolas Almagro is one of the world's best players on clay court. To know more about this Spanish tennis player, read this full article. 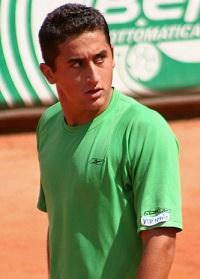 Nicolas Almagro born on 21 August 1985 in Murcia, Spain. Almagro turned professional in 2003. In 2005, he struck at the ATP tournament in Rome with the former No. 1 Marat Safin for the first time a Top 10 player. Almagro won as a qualifier in 2006, the ATP tournament in Valencia . On the way there, he had again Marat Safin and former French Open champion and former world No. 1, Juan Carlos Ferrero defeated. That same year, the Spaniard reached the quarterfinals of the ATP tournament in Rome, where he was the former world number one Roger Federer in three sets just defeated. Bet as the favorites, Almagro was defeated in the second Round of Roland Garros surprising then James Blake. On 26 February 2007 stood at number 28 Almagro in the world rankings, his highest placing so far. That same year, the Spaniard won the tournament again in Valencia. In the final he beat the Italians Potito Starace 4:6, 6:2 and 6:1. Almagro won in February 2008 after the tournament in Costa do Sauipe, he won the third March of the same year, the ATP tournament in Acapulco 500 (Mexico) against David Nalbandian. A year later he won the tournament again in the final against Gael Monfils. In July 2010 he won his sixth ATP title. He won the final of the tournament in Bastad Sweden against the defending champion Robin Soderling in straight sets 7:5, 3:6 and 6:2. It was 2007 before the finals of this tournament, but then succumbed to his compatriot David Ferrer . Only two weeks later in Gstaad by a two-set victory over Richard Gasquet , the next title. Also in 2011, Almagro was able to win an ATP title in February 2011, he won in Costa do Sauipe in straight sets against Alexander Dolgopolow, winning there for the second time since 2008 the title. Only a week later in Buenos Aires by a three-set victory over Juan Ignacio Chela, the second title of the season. In Acapulco , he then had the chance to be the first player at all three tournaments of the "Golden Swing" said the South American tournament series in a year to win. He lost, but after 13 match wins in a row in the final against defending champion David Ferrer, against whom he has now lost for the third time a final.